Craving to eat something new? Well, you've got to try these three quick (except sous vide) and easy Filipino recipes. Savor the distinct and luscious taste of Filipino cuisines. The food of the Philippines is a hybrid born of cross-pollination between foreign Spanish, Malay, Chinese, American influence and the islands’ endemic ethnic local cuisine. If you only learn one Filipino recipe, make it adobo [a vinegar-tart stew]. 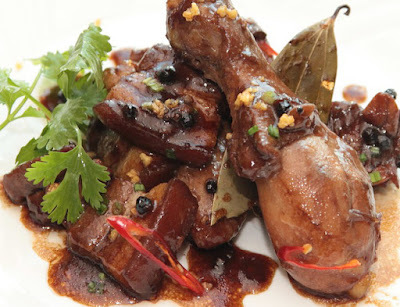 Filipinos are as expected to agree that adobo should be considered the national dish of the Philippines. A dish whose outward simplicity belies a complex balance of sour, salty, savory, and sweet. All kinds of meat, some vegetables and sea-foods can be cooked as adobo. Adobo is a braise flavored with vinegar, salt, and garlic, it’s easy to make and gets better and tastier the longer you keep it. These piquant seasonings, which preserved the dish pre-refrigeration, permeate, lending the main ingredients a greater depth of flavor. In Filipino cuisine, adobo (Spanish word adobar, which means “marinade” or “pickling sauce”) refers to a common cooking process indigenous to the Philippines. When the Spanish first explored the Philippines in the late 16th century, they encountered a cooking process that involved stewing with vinegar. The Spanish referred to it as adobo de los naturales (adobo of the native peoples) due to its superficial similarity to the Spanish adobo. The Filipino adobo is an entirely separate method of preparing food and is distinct from the Spanish marinade. While the Philippine adobo can be considered adobo in the Spanish sense—a marinated dish—the Philippine usage is much more specific to a cooking process (rather than a specific recipe) and is not restricted to meat. There are numerous variants of the adobo recipe in the Philippines. Typically, pork or chicken, or a combination of both, is slowly cooked in vinegar, crushed garlic, bay leaves, black peppercorns, and soy sauce. It is best served with white rice. It was traditionally cooked in small clay pots; but in modern times; slow cooker, electric pressure cooker, casserole, metal pot and wok are used instead. The most basic ingredient of adobo is vinegar, which is usually coconut vinegar, rice vinegar, or cane vinegar (although sometimes white wine or cider vinegar can also be used). Almost every ingredient can be changed according to personal preference. This easy version of adobo is a distillation of different regional styles. The best part of this recipe is that while the pork cooks, the juice it releases combines with the marinade to form a marvelously flavorful sauce, no additional steps required. It’s almost mandatory to serve this dish with fluffy rice; the tasty sauce is crazy good, and you’ll want something to soak it up. 1) Adobo originated as a form of meat preservation, so it can easily be stored for a later date. 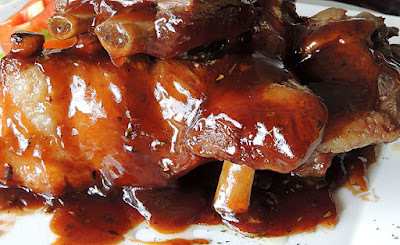 The cooked pork ribs can be chilled in the bag in an ice water bath [please refer to the tips below, (A) Chilling Properly: The Ice Water Bath Method] for 20 minutes and then refrigerated for up to 1 week. Reheat in a 60°C (140°F) water bath for 30 minutes. 2) Preheat your sous vide water bath to 70°C (158°F) using your sous vide immersion circulator. 3) To make the marinade, in a small bowl or liquid measuring cup, combine all of the ingredients and mix well. 4) Place the pork ribs in a single layer in a gallon-size freezer-safe zip lock bag, pour in the marinade, and seal using the displacement method (please refer to method below (B), scroll down). 5) When the water reaches the target temperature, lower the bagged ribs into the water bath (making sure the bag is fully submerged) and cook for 12 hours. I recommend checking the water bath every few hours to see that the bag is still fully submerged. I also suggest covering the bath with plastic wrap or aluminum foil to minimize evaporation (please refer to the info below… (C) Take Cover). 6) Remove the bag from the bath and transfer the pork, along with its precious liquid, to a serving platter. Serve with rice on the side and encourage your awesome guests to spoon the glorious adobo sauce on top of their portion. Minimizing the time window for bacterial growth is the key to safe sous vide cooking. For that reason, if you’re going to refrigerate food cooked sous vide (rather than eating it immediately), I recommend first rapidly chilling the bag in an ice water bath. When I talk about using an ice water bath to chill food, I don’t mean a few ice cubes floating in a bowl. To cool food down efficiently, you want the coldest water possible, which means adding enough ice to bring the water all the way to 32°F. The addition of salt will lower the freezing point of water, making an even colder bath possible. This same principle also enables you to churn ice cream without a machine. The following instructions will produce an ice water bath ideal for chilling your sous vide foods, but don’t feel obliged to follow it slavishly. Think of the ratio as a rough guide. To make a proper ice water bath, fill a large bowl with ice cubes and add cold tap water equal to about half the volume of ice. Next, add kosher salt equal to about one-fourth the volume of water and then stir until the mixture is very cold (it will be about 28°F within about 30 seconds). The ratio is 1 part salt, 4 parts water, and 8 parts ice, so for a 4-quart bowl filled with ice, add 8 cups cold tap water and 2 cups kosher salt. Water Displacement Method. To achieve a proper seal and get most of the air out of a bag without using an expensive vacuum sealer, I recommend the water displacement method (aka Archimedes’ principle). Place the food (including any marinade or sauce) in a freezer-safe double-sealed zip lock bag. Submerge the open bag into the water with only the seal exposed. Everything below the zippered closing should be covered with water. The barometric pressure of the water will force most of the air out of the bag. When the liquid rises to just below the zipper, seal the bag. You should feel and hear the “click-click-click” as it closes. It’s like sous vide music to the ears, assuring you that no water will get into the ingredients. When placing a lot of small items in a bag, strive to arrange all of the pieces in a single layer, without overlapping. This ensures that the pieces will cook through evenly. Once the bag is sealed, run your hand over the pouch again to distribute the contents uniformly before placing the bag in the water bath. Slow and long cooking is a hallmark of the sous vide technique. For recipes that require cooking (or holding) the food for several hours in the bath, it’s critical that the food remain fully submerged for the duration of the cooking time. For that reason, if your sous vide unit does not come with a lid, I recommend covering the water bath with plastic wrap or aluminum foil to minimize evaporation, thus preventing the water level from falling too low. It’s a good idea to check the water bath every few hours. If the water level has fallen below the machine’s minimum, add more water. Although the additional water will briefly lower the overall temperature, that brief fluctuation will have a negligible impact. If you notice at any point that the bag isn’t fully submerged, reseal the bag to remove any air, adding weights to the bag if necessary. Adobo is the easiest savory recipe you can cook under 30 minutes. In this delicious version of Philippine adobo, the coconut milk helps keep the chicken moist and it makes a rich sauce. Are you craving for adobo now too? 1) In a large nonreactive bowl or heavy-duty, resealable plastic bag, combine all of the marinade ingredients. Add the chicken pieces and turn to coat in the marinade. Refrigerate for at least 2 hours or overnight. 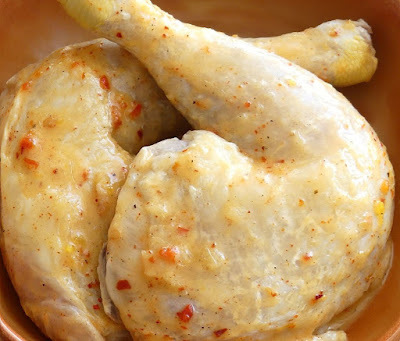 2) In a large casserole or Dutch oven, heat the chicken and marinade over high heat. Bring to a boil, then reduce the heat and simmer, stirring occasionally to make sure the chicken is covered in the marinade, until the chicken is cooked through and tender, 20 to 25 minutes. 3) Transfer the chicken pieces to a large bowl, raise the heat to medium-high, and reduce the sauce until it is the consistency of heavy cream, about 5 minutes. Remove the bay leaves and chiles. Return the chicken to the sauce and cook until just warmed through. 4) Place the chicken pieces on a roasting pan and place under the broiler for 5 to 7 minutes, until they begin to caramelize. Turn the chicken, baste with sauce, and return to the broiler for 3 to 5 minutes more. Transfer to a platter and drizzle heavily with sauce. Because chicken with skin is used some of the fat from the skin will be rendered in the cooking. It is important to remove the excess fat because oil will also form when coconut cream is cooked. This adobo is even better the next day, so you might want to double the recipe to have some left over. 1) Have butcher cut the beef short ribs Into 4 cm- 1 1/2-in cubes. 2) Crush, peel, and mince the garlic. 1) In a mixing bowl, combine the peeled garlic and cracked peppercorns with the vinegar, soy sauce, and bay leaves. 2) Add beef short ribs and marinate for at least 1 hour. 3) In a deep heated pan, brown the beef in oil in two batches over high heat. Add the remaining marinade. 4) Add the water to the pan. Bring to a boil and immediately reduce to a simmer, 82 "C I 180"F, and cook for 1'/2 hours or until meat pieces are fork tender. Season with salt according to taste before the liquid has almost evaporated. There is no agreement among Filipino cooks on how much water to put in adobo. A rule of thumb is “enough water to cover the meat.” Some recipe says to cook until the liquid has almost evaporated, resulting in a drier adobo. So, for those who want sauce, do not allow the liquid to dry up. 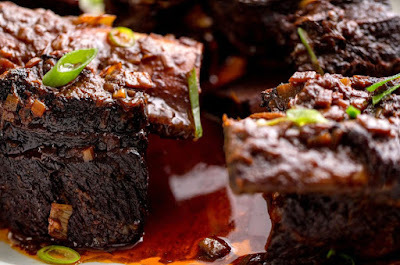 Short ribs work well because beef cuts with some fat result in moist and flavorful stews. Briskets and the neck are also alternative meat choices. Do not add salt until after the cooking process is complete so the sauce does not become too salty when reduced.